Did you know that $50 can provide clean water for a child in Zambia for their entire life? 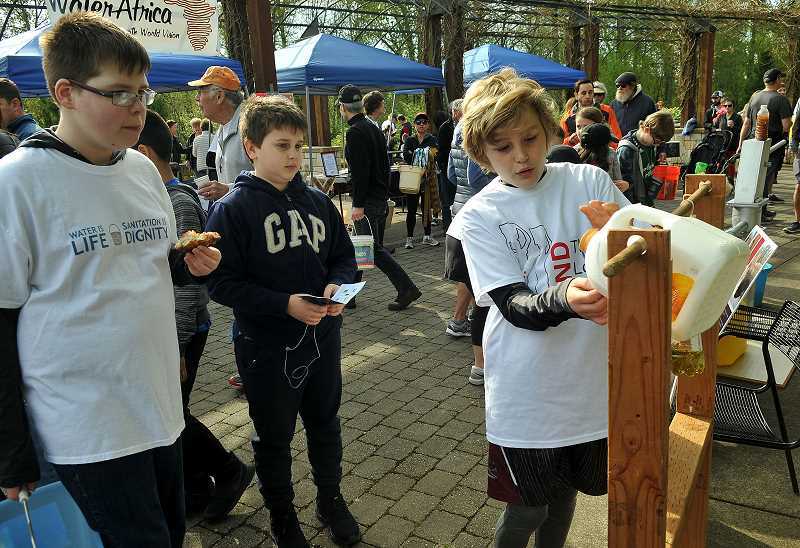 It's true, and it also happens to be the registration fee for adults at the 11th-annual Walk4Water in Lake Oswego, which will take place at 9 a.m. on Saturday, April 21, and feature new ways to connect with the Zambian people who benefit from the popular fundraiser. 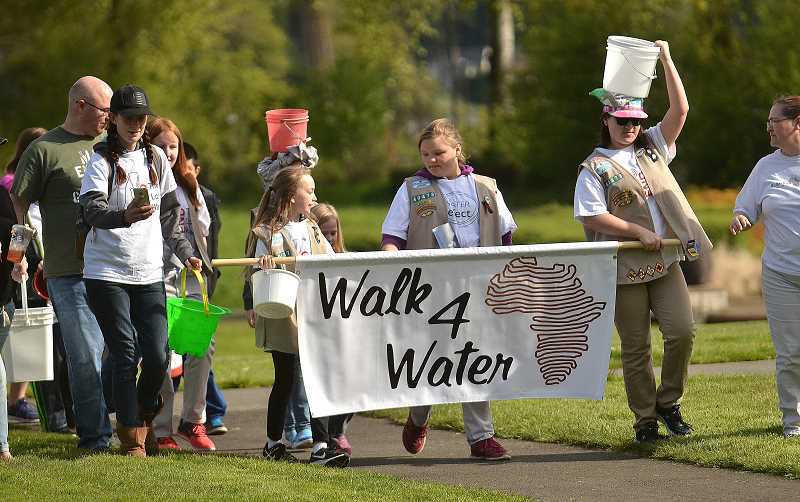 As in past years, participants will dip buckets into the Willamette River at Foothills Park, carry the water to Millennium Plaza Park and then return to Foothills on a 2.4-kilometer round trip designed to simulate the efforts many Zambian villagers must make every day in order to simply exist. "But it's so much more personalized this year," says Margaret Hanscom, a WaterAfrica board member and Oak Creek Elementary School teacher, because each walker will wear a bib featuring a photo of a Zambian child in need of clean water. "You're literally walking the distance that the child on your bib most likely walked that day," Hanscom says. "It's like you're walking it for them." Also new this year: Participants have the option of "going the distance" in the World Vision Global 6K for Water, which actually represents the distance an average Zambian without a clean water source must walk every day. "Often the walk is dangerous, children miss school to fulfill this household need and the water is dirty," says Ashley Colquitt, director of the Global 6K for Water. When you participate in Saturday's event, she says, "every step you take is one they won't have to." The money raised on Saturday will go directly to World Vision, the largest non-governmental provider of clean water in the developing world, which will use the funds to dig new water wells, build handwashing stations, improve water infrastructure and pipelines, train community members to maintain the projects and more. Since 2006, Lake Oswego-based WaterAfrica has raised more than $1.5 million for the international nonprofit, enough to provide water, sanitation and hygiene for more than 30,000 people. The mission now, according to Hanscom, is to double that number — and to get more young people involved in the cause. "This is our third year of bringing the program to a couple of local schools, but our first year at Oak Creek," says Hanscom, who teaches fourth grade at the Lake Oswego school. "We run the program for a couple weeks leading up to the walk, in the hope that their world view is opened and they have a chance to develop some empathy." Hanscom says the importance of water access is easy for young students to understand and appreciate, because it's a resource that they use every day. "They can really wrap their head around it," she says. "You can show them a bottle of dirty water and they understand that it's not OK to drink, but that people are forced to drink it. They get that it's a major problem." Through WaterAfrica's interactive program, students learn about the dangers of drinking dirty water, the lengths Zambian women and girls have to walk to obtain clean water and the impact that has on life in the African nation, including a high infant mortality rate and a lack of education for girls. "Culturally, it's the girls' job to collect water, and often the wells are miles away. So these girls are not able to go to school and get an education," Hanscom says. In addition to Oak Creek, the program is being taught at three schools in Tualatin: Horizon Christian, Bridgeport Elementary and Hazelbrook Middle School. Students from all four schools will bring what they've learned to the walk on Saturday, where they'll set up and staff WASH (Water, Sanitation & Hygiene) stations that highlight different aspects of water infrastructure and sanitation. Hanscom says her favorite part about being on the WaterAfrica board and working on the Walk4Water event is interacting with students. "What I care about most is educating students about the situation. I want to see students who care about the world and have empathy," she says. "If they see injustice, I want them to feel moved to do something about it." Hanscom grew up attending Lake Grove Presbyterian Church with her family, an experience that has helped shape the service-driven lifestyle she now leads. "Growing up at the church and being a part of my family has shown me caring about the world matters to me," she says. "Our church has long had partnerships with World Vision. Being a part of a church that feels responsible for the lives of others has really motivated me." Registration for Saturday's events is available online at tinyurl.com/Walk4Water11. The cost is $50 for adults and $25 for children. Walkers can also sign up on the day of the event, but Hanscom warns that the supply of T-shirts and race bibs is limited.